Butternut squash is a winter squash that has a firm texture and nutty flavor. The smooth-textured vegetable offer a variety of nutrients including vitamins A and C, riboflavin and iron. Although cooking it in the oven can take over an hour, you can quickly prepare squash in the microwave in less than 20 minutes. Wash the squash to remove dirt and dry with a dish towel. Its skin should be firm and free of cuts or bruises. Slice off the stem end, then cut the squash in half lengthwise. Spoon out the seeds and fibers. Position the squash, flesh side down, in a large microwave-safe dish and microwave on the highest setting for 5 to 8 minutes. Take the dish out of the microwave and turn over so that the flesh is face up. Microwave for an additional 5 to 8 minutes. The flesh should be tender. Let it stand in the microwave for an additional five minutes. Remove the vegetable from the microwave. Scoop out the flesh and serve mashed or add to a favorite recipe. Cooking time may vary depending on your microwave and the size of your squash. 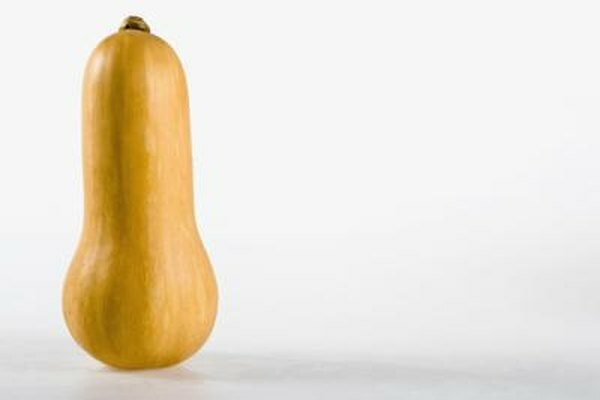 Uncooked butternut squash can be stored in a cool, dry area for up to 6 months. Remove the dish from the microwave with oven mitts to avoid burns.